In this free download students read, then cut and paste the story sequentially in the correct order. A great way to assess student understanding of first, then, next and lastly and a building block to numeracy and literacy concepts. 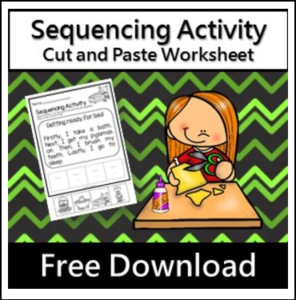 This sequencing activity sheet forms part of the Sequencing Activities Pack 10 cut and paste activity sheets. This download does not contain photographs but uses quality clip art – please study the preview images to make sure you understand what you are downloading. This product is designed for K (Prep) to Year 1 students. Please contact me if you have any questions prior to download. If you enjoyed this free download please leave a four star rating. Sequencing Events in our classroom maths activity. Sequencing Picture Cards – 12 sequence card sets and sorting mat. Sequencing Activity Pack – 10 cut and paste activity sheets.